True beef or not true beef? that is the question two volunteers masticating a burger in front of an invited audience in a London theater attempted to answer Aug. 5. Developing this version of the global fast-food staple in a laboratory had taken three months and eaten up £250,000 ($331,400). "It's close to meat," mused the first taster, Hanni Rützler, a nutritional scientist, swallowing with some difficulty. "This is kind of an unnatural experience," confessed the second taster, Josh Schonwald, a writer, as he chewed on history. He meant the lack of ketchup. Schmeat--or "cultured beef," as the patty's progenitor, Mark Post, a professor of physiology and biomedical technology at Maastricht University in the Netherlands, calls it--is the culinary product of stem cells harvested from a cow's shoulder and lab-nurtured into strips of muscle. It's hailed by proponents as a potential solution to several juicy existential problems. The demand for cheap meat has been met at a high price to the environment--contributing greenhouse gases and diminishing biodiversity as ever more land is given over to feed crops--as well as risking human health and animal welfare. In Britain, beef eaters have experienced some of the downsides of industrialized farming and food production: an epidemic of bovine spongiform encephalopathy that spiked in the early 1990s, a foot-and-mouth epidemic a decade later and, this year, the revelation that the "beef" in certain prepared foods was actually horse meat. Schmeat production, if scaled up enough to bring prices down, could help feed the world and reduce some of the pressures on the planet. The quest to develop in vitro meat is riven with apparent contradictions. Can this most processed of processed foods be healthy? Is it possible to solve problems created by our greed for meat by making more meat more cheaply? Post macerates the muscle cells in a broth that includes fetal-calf serum, obtained by slaughtering pregnant cows, yet his work is lauded by some vegetarians. "Our goal is to promote foods that don't use animals at all," says Ingrid Newkirk, president of People for the Ethical Treatment of Animals (PETA), an animal-rights organization. "But enormous swaths of the population can't bring themselves to become vegan, so it's logical to support in vitro meat if its goal is to reduce suffering." PETA has funded research into in vitro meat for 17 years, says Newkirk. And the deep-pocketed mystery backer of Post's project was unveiled in London along with the burger: Google co-founder Sergey Brin. 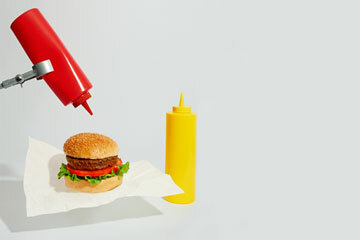 In a short film screened before the burger tasting, Brin acknowledged that some critics dismiss the prospects for mass-produced schmeat as science fiction. He added, "I actually think that's a good thing. If what you're doing is not seen by some people as science fiction, it's probably not transformative enough."